ictDATA.org: The end of P2P SMS revenue? The end of P2P SMS revenue? It is becoming more difficult to determine revenue data for P2P SMS, particularly in markets where bundled mobile subscriptions are becoming increasingly prevalent. If unlimited voice, messaging and data are bundled in a mobile subscription plan, then how can their revenue shares be determined? The United States Federal Communications Commission (FCC) used to estimate messaging revenue but gave up after 2008 due to the prevalence of bundled plans and now just identifies voice and data traffic although even splitting those is becoming increasingly problematic. In 2008, the FCC estimated that text messaging revenues in the United States were US$11.4 billion. With a total volume (sent and received) of just over 1 trillion messages, the average revenue per text message (sent and received) was US$0.011 (1.1 US¢). Similarly in 2015, the French regulator announced it would no longer provide a breakdown of mobile revenue due to the prevalence of bundled plans. The difficulty of determining P2P SMS revenue is less of an issue in countries where prepaid is prevalent. 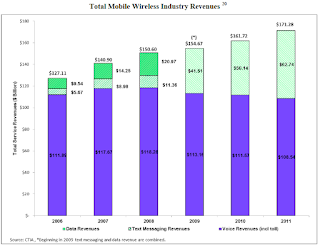 Here it is relatively easy to determine messaging revenue based on pay per use or text plans. At the end of 2014, except for North America, there was sufficient messaging revenue statistics to estimate a global total. One can assign a value for North America based on the average price per message calculated for the rest of the world. 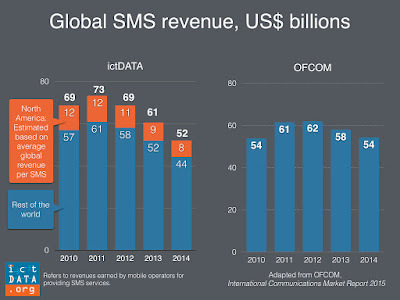 The UK regulator, OFCOM, also has an estimate of global SMS revenue in its 2015 International Communications Report. The figures are somewhat close to the ictDATA numbers. Including the articifical estimate for North America results in a global estimate of US$52 billion for text messaging revenue in 2014 compared to OFCOM's estimate of US$54 billion. Over time, as voice and messaging migrate to Internet-based applications, then all mobile revenues might be from data.